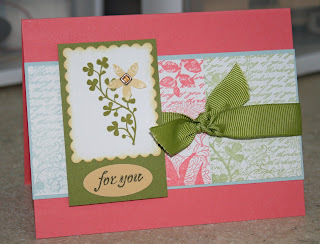 I really liked the color combo and the sketch that I used yesterday, that I made a second card. I used the new "Sneak Peek" Fresh Cuts stamp set. It is available through June 30th with a set of white gift cards that are die cut. The card base is Cameo Coral and I stamped all three of the panels with the main image in the set, but in different colors and different sections of the stamp. I used Soft Sky, Cameo Coral and Certainly Celery, I layered it on Soft Sky. For the main image I stamped the leaf in Old Olive and used the flower punch that is now retired and punched out the stamped flower in the set. I attached it with a Rhinestone Brad. I used the Nestibilities rectangles and dauber to ink the edges in So Saffron. For You is stamped with Old Olive on So Saffron and punched out with the small oval punch. I tied the Old Olive 5/8" grosgrain. I heading back up to Tallahassee tomorrow (Monday) to stamp with my friend Trish and will return Wednesday.